There are few fitness lessons as important as the one you can learn from Captain Jean-Luc Picard. 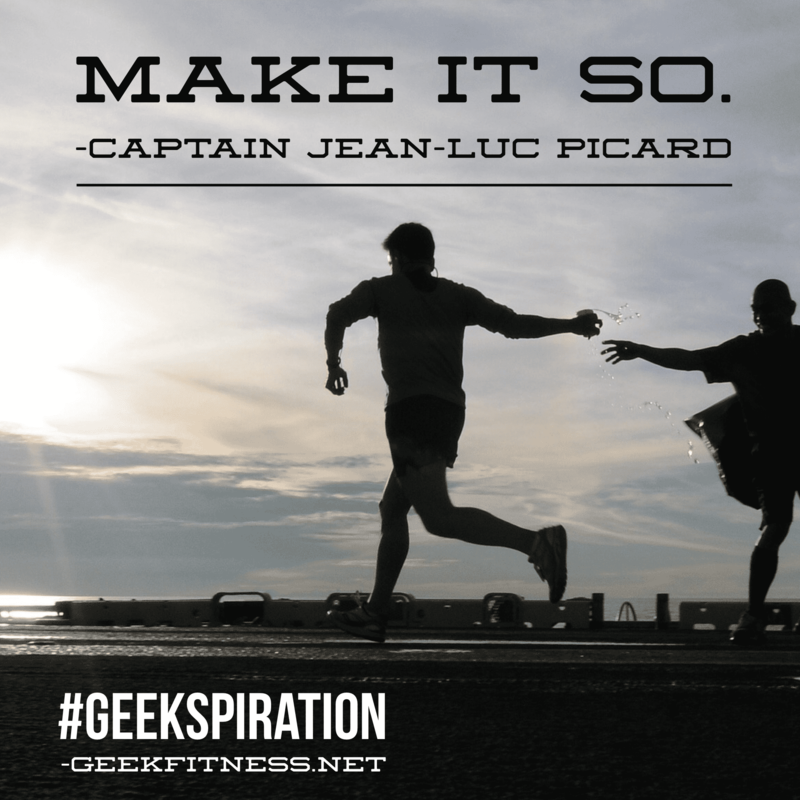 Instead of whining about what might or might not happen, instead of making excuses, Jean-Luc simply says, make it so. Sure, his decision to move forward typically comes after long deliberation and weighing of the options, but the primary motivator is getting things done–and getting them done right. He doesn’t second guess himself (often). He doesn’t make decisions on the fly. He doesn’t go into a situation without fully understanding the repercussions of any decision he is going to have to make. And that’s how you should approach fitness. You shouldn’t second guess yourself. Jean-Luc didn’t second guess himself, did he? Do like he did in a stressful situation: do adequate research before starting a workout program or a nutrition plan. That’s it. Then you can simply make it so. Once you know what to expect, it’s all trial-and-error as to whether it works for you. It might. Or it might not. The hard part is mentally getting to that point. That hard part of this isn’t the actual trial-and-error that you have to deal with, but the idea that trial-and-error includes error in the first place. You may try some things–running, power lifting, low-glycemic, Paleo, whatever–that simply do not work for you. And that’s okay. If something doesn’t work for you, then don’t do it. But you should know from experience that it doesn’t work, not from lack of trying. Jean-Luc Picard made a lot of mistakes in his career as a Starfleet officer. He had a lot of setbacks. And so will you. You will make a lot of mistakes as you work toward your fitness goals. You’re going to run into a lot of things that hurt you and scare you. You’re going to find a lot of things that you hate. And you’re going to find a lot of things that you love. But you won’t know about any of them if you just sit on your couch. You won’t know if you love to run until you run a few miles. You won’t know if you love the Paleo diet until you eat it for a month. If, after that, you realize they’re not for you…great! You had a few experiences and are wiser for them. You might also realize that the experience was transformational and that you never want to stop doing it. And in that, you’re also wiser. But in both cases, experience is the only teacher you can have. Fear, excuses, and long deliberations won’t teach you anything you can’t learn on your own, from doing something new yourself. So if you’re in a fitness rut, or if there’s something you have always wanted to try, think about Jean-Luc Picard. Think about Star Trek. Whether you’re about to fire on a Borg cube, evacuate refugees, train for a marathon, or increase your deadlift, set your sights on what has to be done to get there…and then simply make it so. So needed to read this today, B. J. I’m limping today after some real pain around my achilles area, at the end of a 9.28 training run yesterday. I haven’t experienced pain there before, so combined with the work I’ve put in at PT, my surgery, and more PT, I was his fed up and thought perhaps I should find something to immerse myself in. The problem with that idea is that not only am I immersed in my running, it’s therapy. It’s exercise, it’s my time, it’s party of who I am these days. I love it. So I’ve found a part about it I don’t love and will have to work my way through it, even if it means I have to cancel my half in a few weeks. I’ll just learn from it, move forward, and “make it so” . Thanks, again. Darlene, getting this comment made my day. Thank you! I totally agree with you on how running works for me, and it’s my therapy, too. Even on those bad days. Ah, Jean-Luc Picard. Perhaps my favorite of all Enterprise captains. It’s always good to keep your eye on the big picture and then make the adjustments and take the steps needed to get there. I am the same way, Jenn. I adore other captains, but Picard is always going to be special to me. I know she wasn’t on the Enterprise, but I do love me some Janeway, too.